With a solid background of some 25 years of music, they present today a unique and sparkling instrumental blend of World Music including Bluegrass, Folk, Irish, Jazz, Classical… influences on the 5-string Banjo,Guitar,Mandolin and Bass. 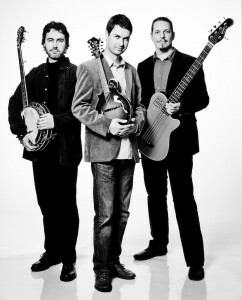 The Louvat Bros. won the « 2012 Liz Meyer Award » at the EWOB – European World of Bluegrass convention in the Netherlands. This award rewards the most innovative European band in Bluegrass music. They performed numerous concerts and festivals in Belgium, all over Europe as well as across the USA ( four times at the Oklahoma International Bluegrass Festival, IBMA showcase in Louisville, to name a few…) and Canada. « First of all, these young men must have wonderful parents. They have obviously been guided in the right direction as both of them are real gentlemen. In addition, they are fantastic musicians. When I first met Steve and Jefferson, I was Impressed with their enthusiasm and eagerness to learn bluegrass music, they succeeded very well. It is not often we get to hear brothers play music together, and left – handed too ! « With this short but superb selection of instrumentals and vocals, the Louvat Brothers, Belgium ‘s best-kept bluegrass secret, make an impressive recording debut. Check out Steve’s original composition « Virginia Water », which showcases his complex and compelling banjo playing as well as his writing skills. And Jefferson ‘s outstanding performances on guitar and mandolin and his strong singing complete the picture.